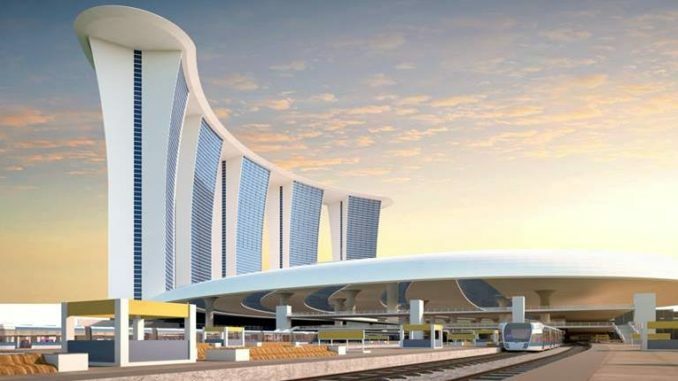 A truly seamless multi model transport hub integrating all modes of transport is to be developed at Surat Railway station wherein all the three levels of Government, namely Central Government (Railways), State Government (Gujarat State Road Transport Corporation) and local government (Surat Municipal Corporation) have come together to pool their lands and also form a SPV named SITCO. This unique initiative is being spearheaded by Indian Railways Station Development Corporation which has been entrusted to implement the task of Railway Station development/redevelopment projects of the Ministry of Railways. Increased Built-up Area (BUA) – Proposed Commercial Development BUA increased from 5.07 lakh sq.m. to 8.40 lakh sq.m. BUA definition modified to exclude basement(s) or any upper floor(s) for satisfying the parking/ fire requirements as per local byelaws. Reduced Mandatory Cost – Estimated Cost of Mandatory project has been reduced from INR 1,008 Cr. to INR 895 Cr. Increased Commercial Retail Area on Ground Level – Commercial Area at Ground level increased from 3,54,864 sq.m. to 7,84,596 sq.m. considering the local demand at Surat. Increased Commercial Development on West Side along Ring Road – Commercial Area increased on West side by shifting the proposed Railway Quarters to Udhna. Flexibility for Planning Explicitly – Flexibility has been given to the developer to modify the Commercial Development Plan without disturbing the arearequirements and intent of Mandatory Project.Master Plan has been revised to provide more commercial area on ground. IRSDC being declared the nodal agency by Union Cabinet for Railway Station Redevelopment and given full powers for plan approvals over railway land and no change in land use required. Special Development Control Regulations – Govt. of Gujarat issued notification regarding relaxation in Comprehensive General Development Control Regulations (CGDCR) – 2017 considering MMTH Surat as a Special Project. FSI of 4 is available as per Transit Oriented Zone (TOZ)without any charges. Master Plan Approval from Stakeholdershad been done. Land Entrustment from Stakeholdersis in place. Railway Land Entrustment confirmed from DRM Office.Expected to be approved soon from Western RailwayHeadquarters. In principle approval for Land Entrustment given by SMC & GSRTC for their respective lands. Airport Authority of India (AAI) approval has been obtained – maximum permissible height has been relaxed up to 121 mt. AMSL as per NOC. Environmental Clearance is under process – Application filed on 07.09.2018 and first meeting for TOR of EIA held with State Environment Appraisal Committee (SEAC) on 14.11.2018. Flexibility in Commercial Development – Only 40% of the Commercial Development Project to be completed in 8 Years from Effective Date. Balance 60% can be completed in 15 years from the Effective Date (extendable by another 5 years without levy of liquidated damages). Performance guarantee for Commercial Development Project has been reduced from 100% to 40% of Commercial Development Cost. Milestones of Project Development Fee Instalments payable by the Developer has been realigned to reduce upfront expenditure of Developer. Interest rate on balance lease premium payable by the Developer has been reduced from 15% p.a. to 12% p.a. Station Revenue Share payable by the Developer to SITCO has been reduced from 50% to 35%. Maximum tenure of Sub-License at a time has been increased from 3 years to 9 years. The bid opening date has now been extended to 07.12.2018 based on the request of bidders.